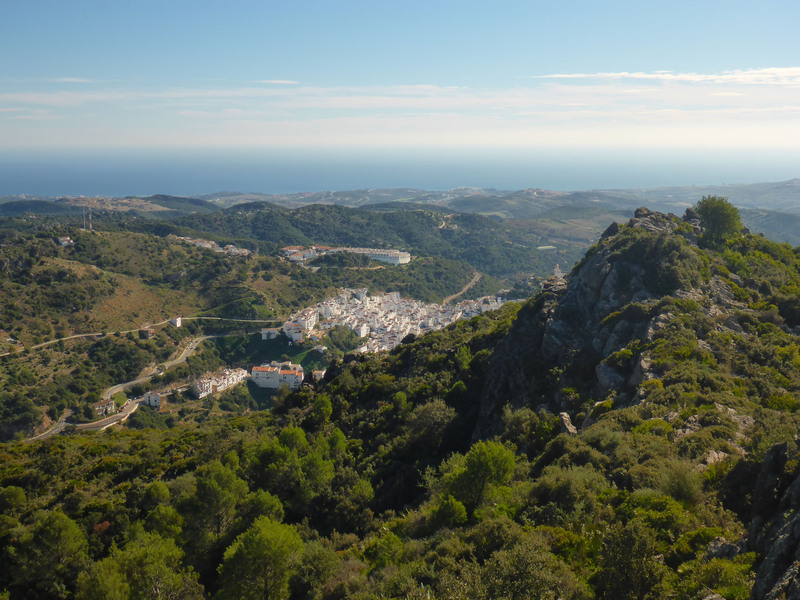 We left Olvera early (for us) and followed the winding mountain road a little way south, to Ronda. The drive was spectacular, the snaking road clinging precariously to the mountainside, with views out over the rolling hills and valleys below. The neat undulating hills, set like moguls in the snow, were still lush and green, with only a hint of autumnal colours beginning to show. The sky was clear and bright, with a light misty cloud sitting low in the valley below us, but this was soon to burn off. The day was still but sharp and cold, the air yet to warm, but the luminous sunny glow outside looked much more inviting than the 6 degrees showing on our dashboard. 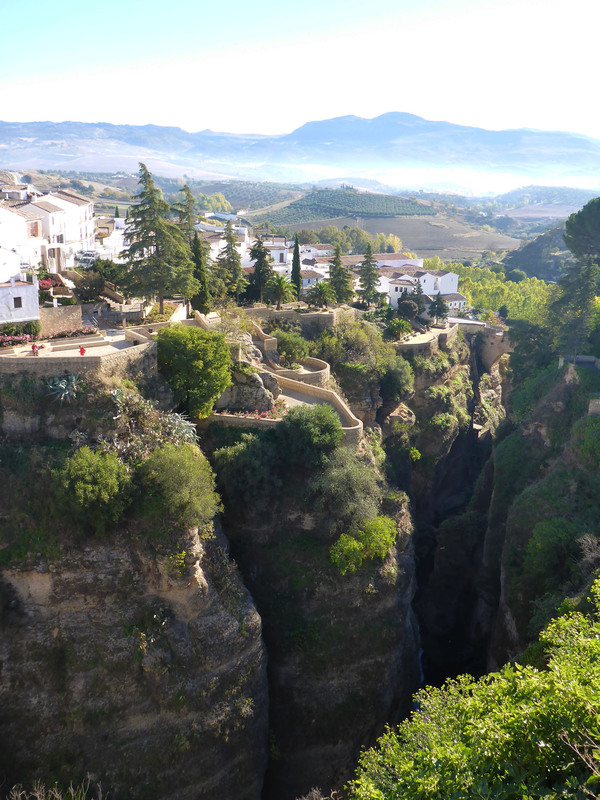 After dropping into the valley and slowly climbing back out, we arrived at Ronda. A short way into town we parked up, as previously advised, in the train station car-park, around a mile away from the old walled city; this left us a nice brisk walk to help warm us. Still in shorts, having worn long trousers on only three occasions so far in the trip, but with thick sweaters on, we marched along in the direction of the Puente Neuvo. Trying to avoid shade and catch as much direct sun as possible to stay warm, the opposite of most previous walks, we shortly reached first the bullring and then the bridge to the old town. We spent some moments admiring the setting and the bridge, but having arrived early, the sun was directly in our faces as we looked on into the old town. We walked around the side of the Tourist office and enjoyed views across the chasm to the opposite side where buildings had been placed precariously on the clifftop edge. The impressively tall Puente Neuvo led us over the deep gorge to the historic areas of the original walled city. We turned left, passing several museums and palaces, before descending to leave the walled city again, in search of other interesting vistas, via the Puento Viejo. 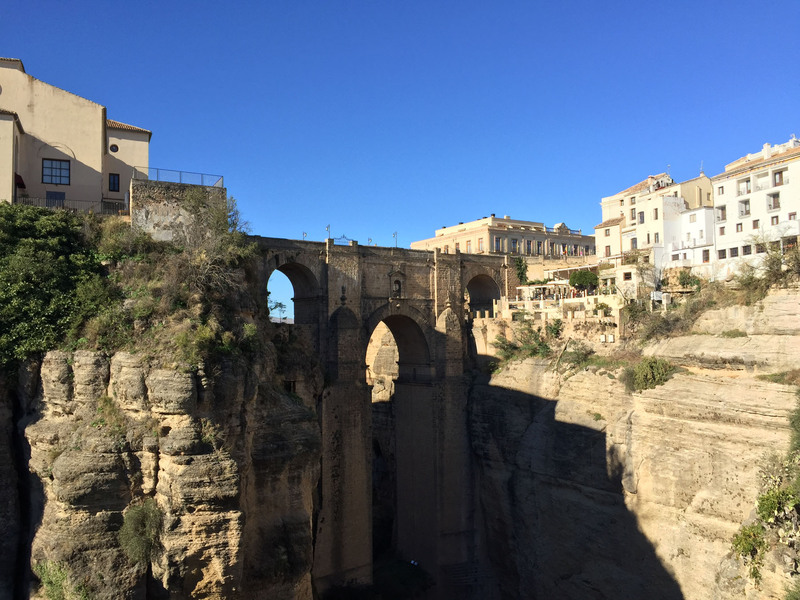 We climbed up through nicely terraced gardens to look back on the Puente Neuvo, now really able to appreciate its quite impressive construction and the depths of the gorge below. We wandered around the narrow streets of the historic quarter for a few hours, taking in all the sights, including the Iglesia de Santa María la Mayor and the Iglesia del Espirítu Santo. 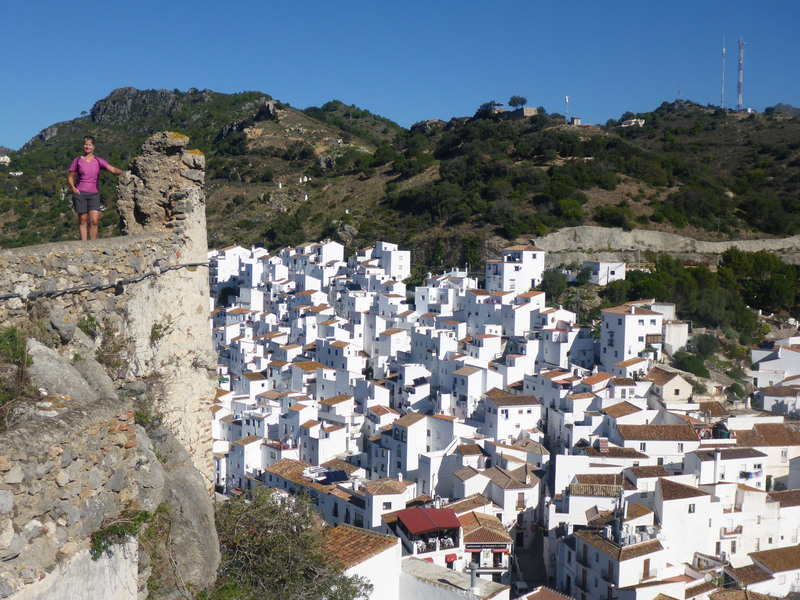 We then, from the corner of the Palacio de Mondragón, found a path leading down the side of the mountain to another mirador, allowing a wonderful perspective on the elevated setting of the town. 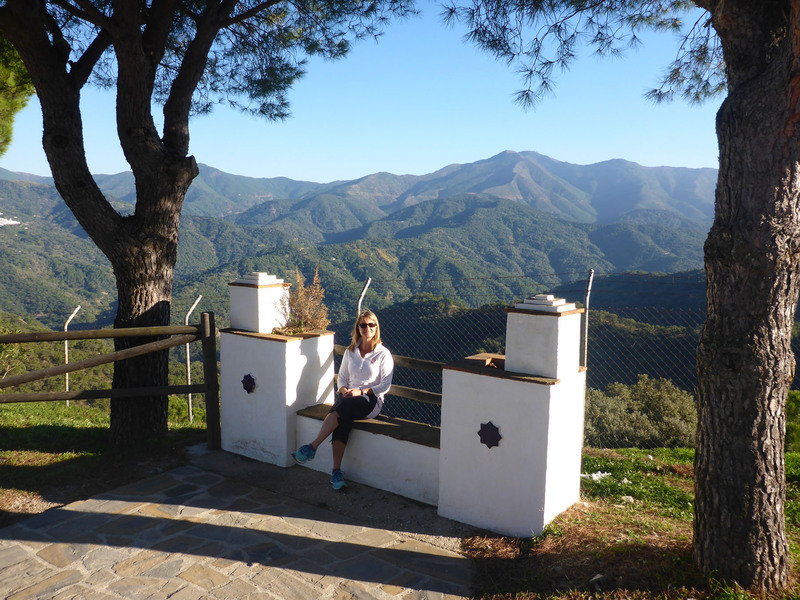 Leaving Ronda, we travelled further south into the quiet, rural mountains. 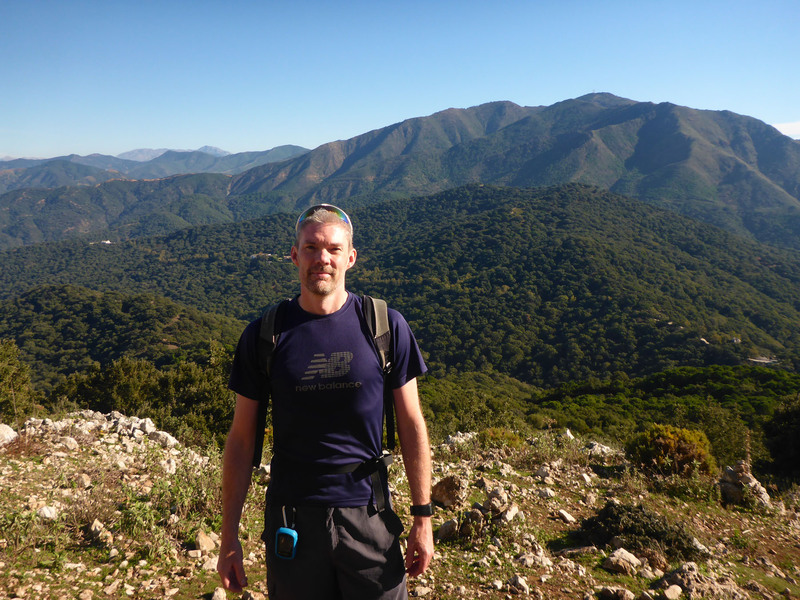 We arrived in our chosen aire for the night, just outside the village of Benarraba, after a hair-raising and quite spectacular drive through the wooded mountains, twisting and turning over multiple hairpins with sheer drops on the outside. We were thankful the roads were empty, with us passing only a few other vehicles on the way, as the quality of the road surface was so poor we had to drive a lot on the left, weaving and bobbing, to avoid the gaping tears and deep potholes in the broken tarmac. But the views more than made it all worthwhile. It turned out to be a very nicely positioned but rather overdesigned aire with personal services, water supply and grey-water drain, at each individual parking spot. There was only one other motorhome in place, so we happily set up camp on the spacious end road side plot and enjoyed long views down the mountainside and beyond. We relaxed a while and had a bite to eat, overlooking the lush valley below. We sat here in the mountain quiet with the sun on our faces, where we had another spontaneously giddy and joyous moment, with the realisation that arriving in such beautiful places and enjoying such mesmerising views is now what we do, the norm rather than the exception. Our thoughts turned again to those days back in full time work, and the inevitable comparison of what we would ordinarily be doing on a cold, damp Thursday in November in England; not this, we were still enjoying sunshine rather than enduring cold and rain. 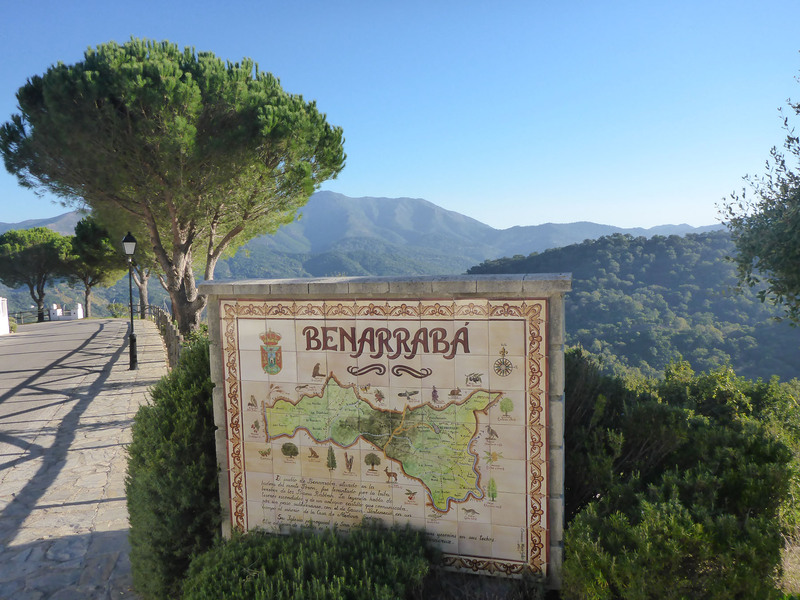 We walked the short distance into the local town of Benarraba, down a steep hill, open on one side to the valley below. Another sprawling Pueblo Blanco town, the narrow streets maze-like, steep sloped or stepped and often cobbled or surfaced with flat rounded stones on edge. We explored the town on labyrinthine paths reminiscent of our visit to Cudillero in northern Spain. We found a pretty local church hidden away at the centre of the village. The aire was unfortunately located adjacent to a noisy recycling centre, where a small diesel run front-loading dump truck made constant rounds, collecting bins from the village and depositing their contents in large skips for collection. 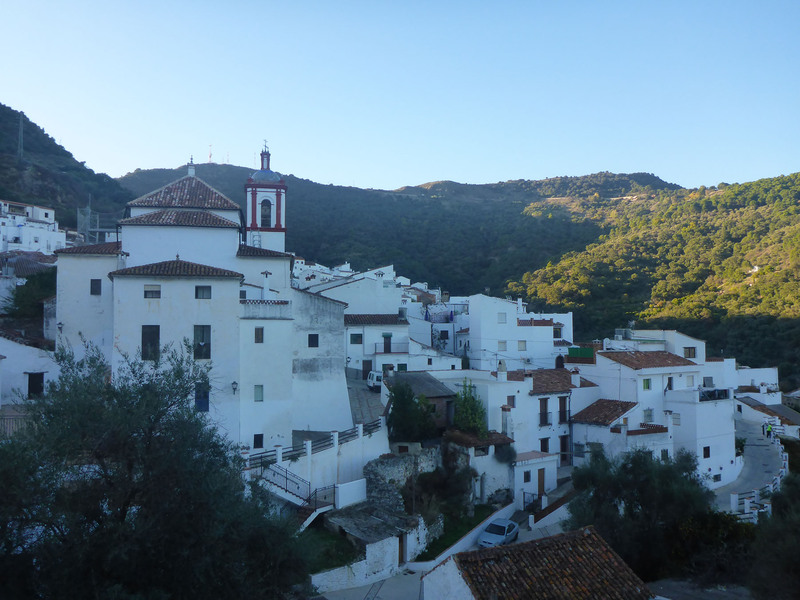 No larger vehicles, and certainly not our motorhome, would make it around the tiny streets of Benarraba, making the man with the mini-dumper, who masterfully squeezed around every tight corner with ease, the key mover and noise-maker in the village. But despite the late bin-collections we still enjoyed a beautiful, mellow sunset from our single-use home with a view. The next morning we moved on again, another short distance south. 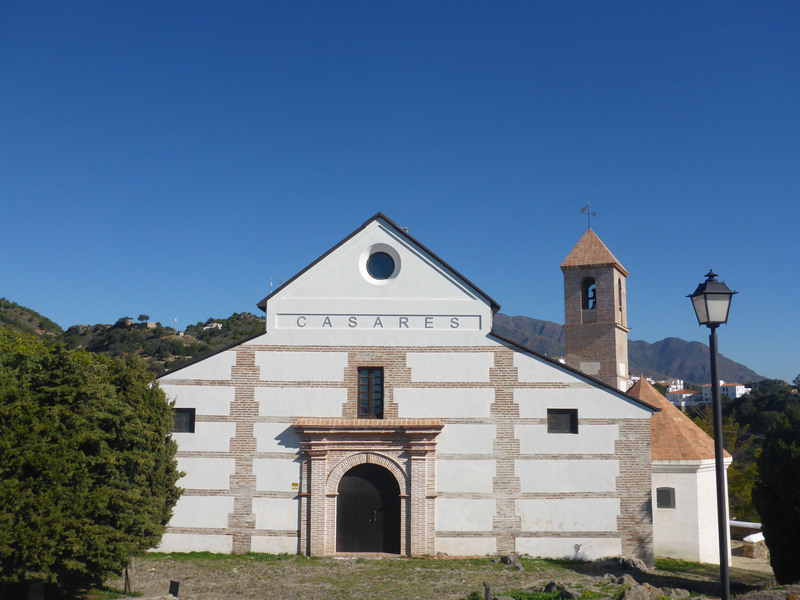 We arrived on the outskirts of the village of Casares, where we could park up for a few nights at the local tourist office centre, a brisk fifteen minutes walk from the town set in the valley below. 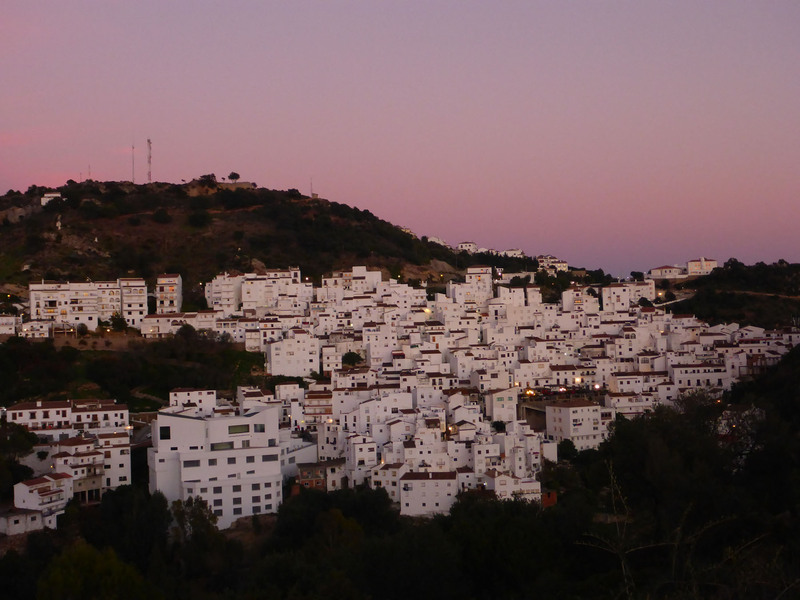 Casares was another sprawling Pueblo Blanco, clinging to the contours of the hillside, set in the shadow of some impressive peaks we later hoped to climb. After a brief look in the tourist office to ascertain a few walking routes, we decided to walk into the town. 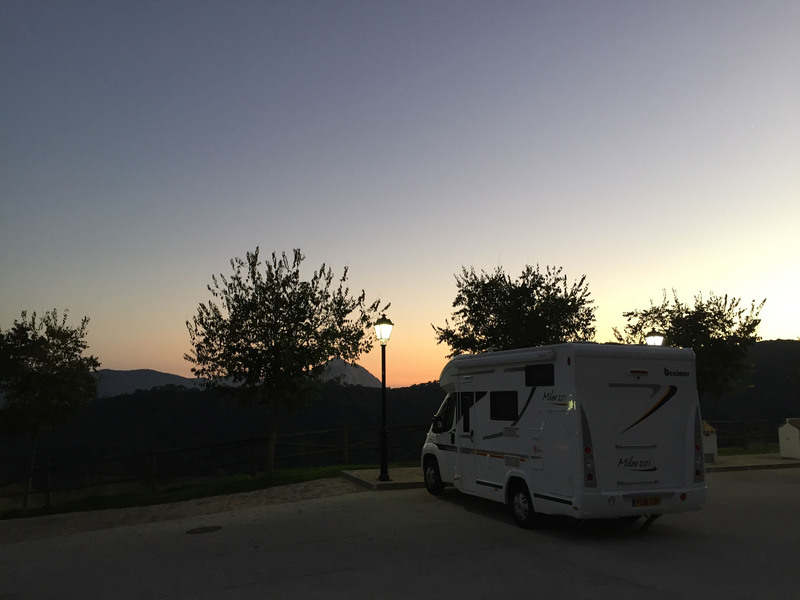 We were delighted to discover there was free wifi that we could pick up from the comfort of our motorhome, so were definitely content to linger here a few nights. 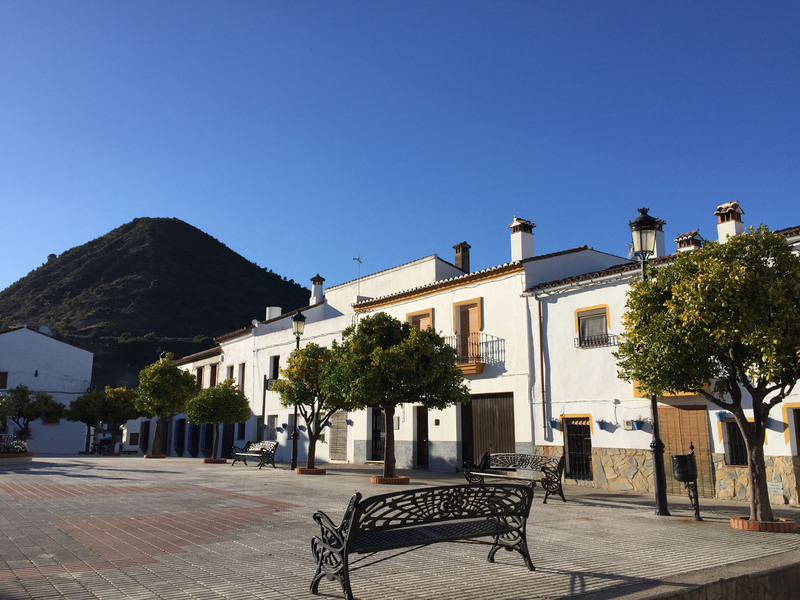 We walked through the steep, narrow streets to the Plaza de Espana, the main heart of the village, where locals sat in dark corners and watched us pass. A market was underway in an adjacent plaza, selling mostly fruit and vegetables. We continued further up to the walled historic area, where the ruins of a Moorish castle and a recently built church dominated the view. Doing a full loop around and through the town allowed us to enjoy many varied and different viewpoints of the town, each with something else to offer. From certain perspectives the tight-knit simplistic square buildings began to look like a cubist painting, all light and shadow and limited palette. It was a fascinating setting, and constantly threw up remarkable vistas, memory-tweaking discoveries and thoughtful moments . We passed a very inviting municipal swimming pool that was meant to be open according to the posted signs, but was firmly closed. We enquired later in the tourist office and were looked at as if we were mad for even considering swimming at this time of year. We enjoyed a lovely local sunset over both the town behind and the coast in front, from a viewing platform only a few minute’s walk from our parking spot. We watched the local griffon vultures circling above us, riding on rising thermals with only a rare beat of their metre-long wings. 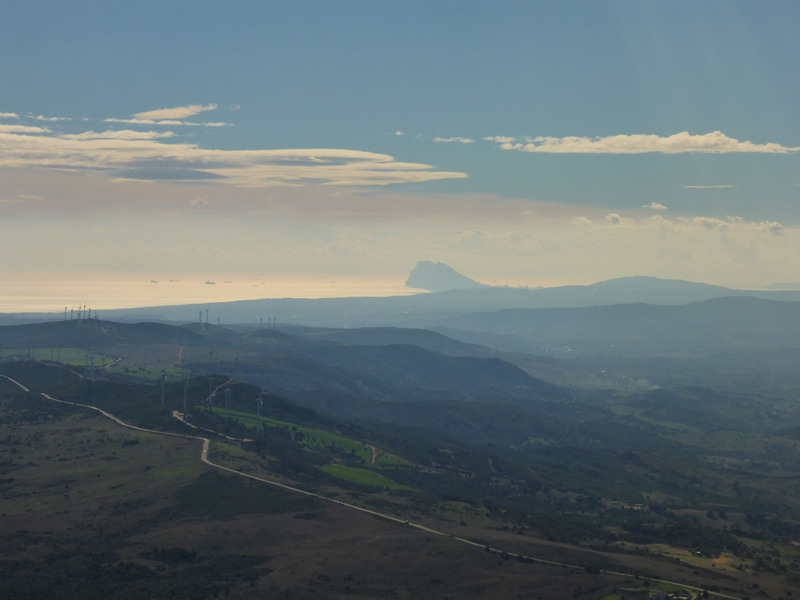 We could see the Rock of Gibraltar standing tall above low cloud in the distance, behind a row of wind turbines on a nearby hilltop. This morning was a clear, bright sunny day, although the air temperature was very cold in the shade; a perfect November day for some proper hill walking. We had scoped out a decent local walk, taking in the main peak we could see framing the town. We booted up and headed off, firstly in the direction of the town, along the main entrance road. We sought out the sunny side of each street and path, in an attempt to keep warm, as the walk along the flat road was still not active enough to lift our temperatures. We soon turned left onto a narrow concreted path leading up the hillside, and this soon became gravel and dust underfoot. On this approach path I had to replace my ambitious sun hat with a winter woolly hat, brought along only for the summit, as we were now stuck continually in deep shade and the morning air was still biting cold. The path began to steadily rise, and this new effort helped to warm our cores, but we still felt the nip of the coming winter on our ears, fingers and toes. To be fair, we were still wearing shorts, so couldn’t complain too much. We continued upwards, reaching a junction in the lower wooded slopes where the path continued around at a lower contour. 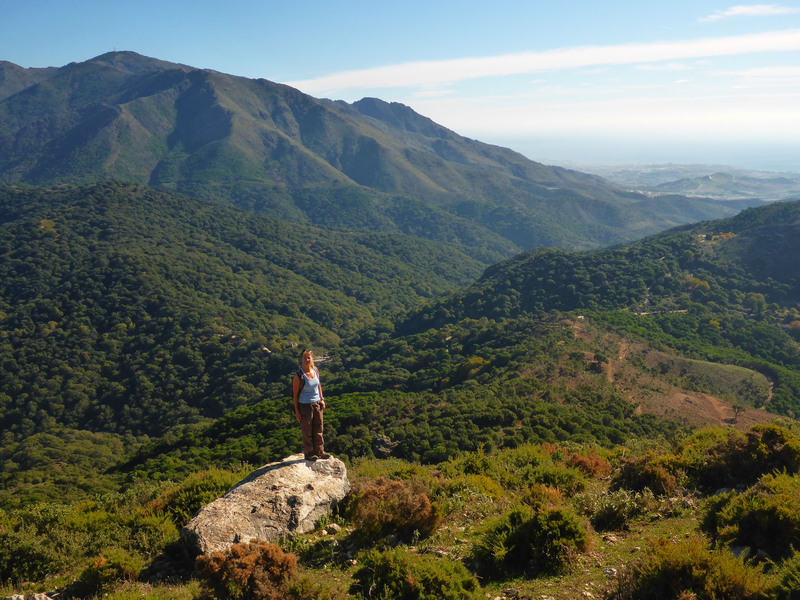 This was our route back home, but first we had another goal; the steep walk up to the summit of Cerro de las Chapas. The route led along a path littered with pine needles and offcuts of branches, like the whole forest had recently been cut back to aid our passage. Then we passed through an area of low, thorny scrubs and prickly plants that cut our legs from the sides of the tightly constricted, overgrown path. With griffon vultures still circling overhead, we continued ever upwards, the path becoming more of a bouldered scree slope as we approached the top. 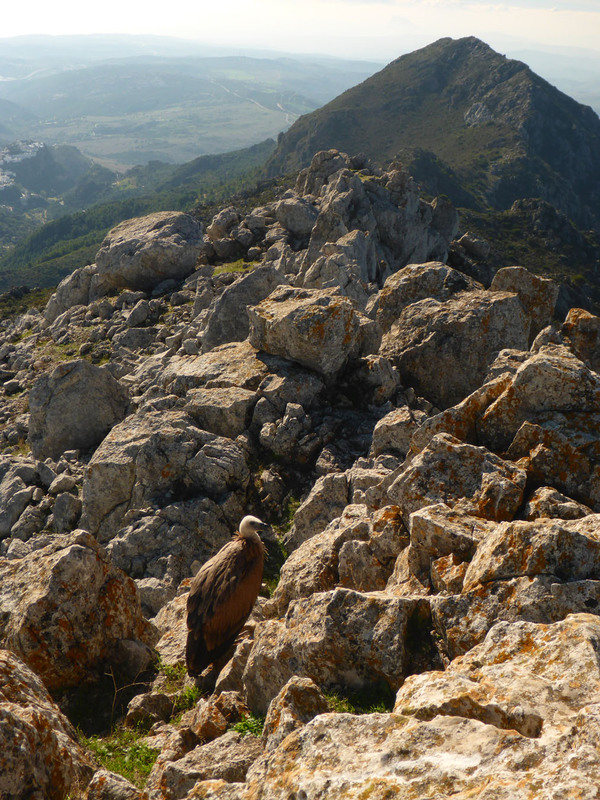 In the midst of the climb, Nicky suddenly stopped dead, with a look of shock and surprise – behind one of the rocks only a few metres to our right, was a resting griffon vulture. We were so close and could really take in the impressive and intimidating size of the bird, only previously seen in the sky far above us. The bird showed no fear of us, standing proud on a rock like an oversized plump, prized turkey. After a long moment of us both staring at it in bewildered awe, the bird slowly unfolded its enormous wings and, despite its huge size, took gracefully to flight to join the others above. We continued up to the summit of the climb, at 943m. 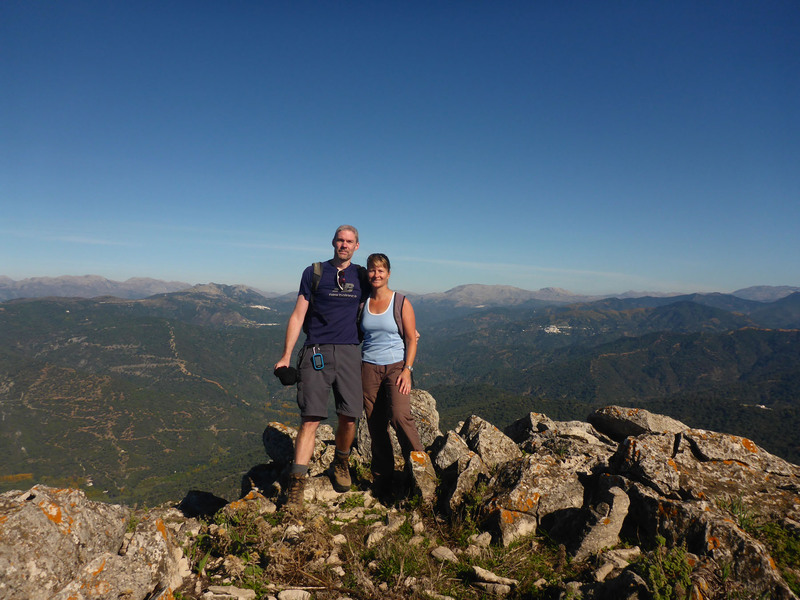 We enjoyed the expansive views across the local mountain, the plains below and out to the Mediterranean Sea beyond. We explored the tall, rocky outcrops on the summit for a while, enjoying the now warm sun on us. As we enjoyed our summit, another landing griffon vulture settled heavily into a space on the rocks right adjacent to us, its actions both simultaneously surprised and scared us. Again, it sat in peace, unfazed by our presence, as we gaped in wonder. For several minutes we sat and watched, only two metres away from the impressive vulture, before it took off again to join the crowds circling overhead. We retraced our steps downwards, to rejoin the original path and this time turned right, leading around a high contour of the Serra Crestallina at a height of around 700m. 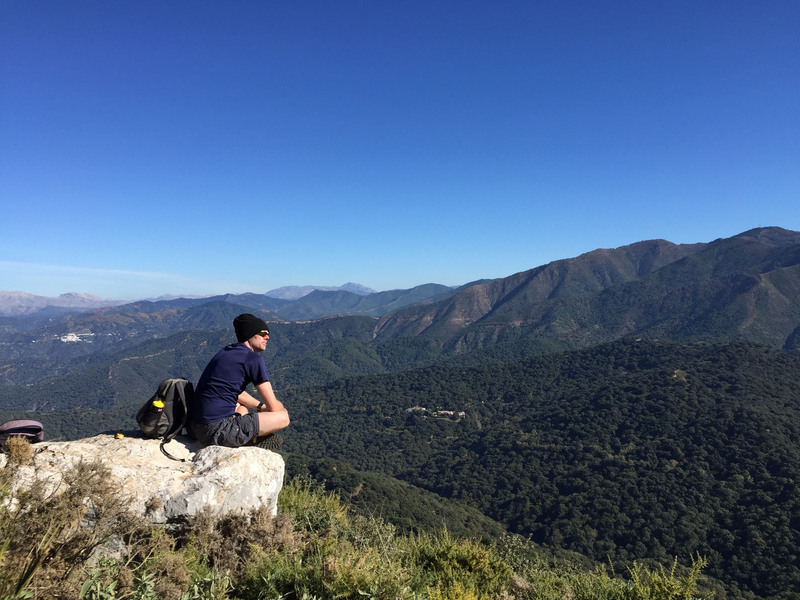 This easy path led back in the direction of Casares, with great views of the internal valley, but first with a stop at a mirador point to see a further perspective on the Pueblo Blanco below. We passed a refugio on the way down that looked like a great stopover point for the long multi-day walks that passed through this valley. 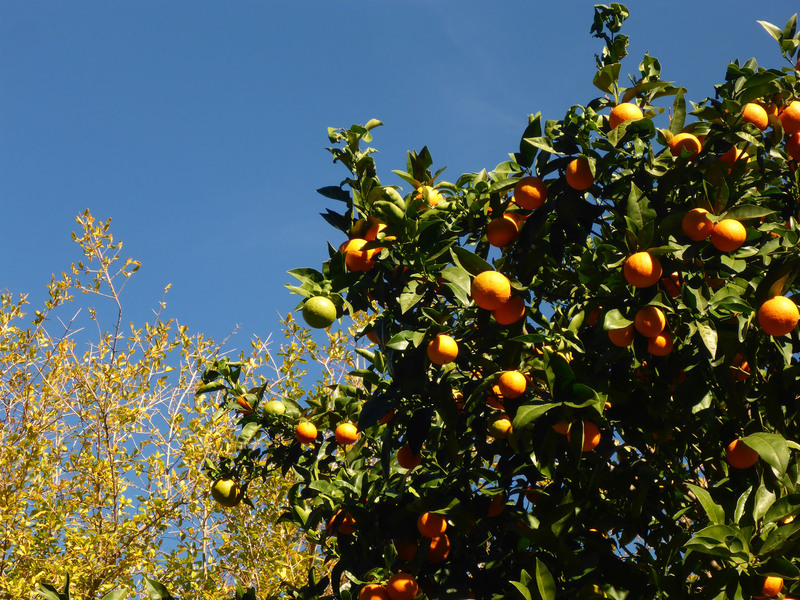 Many rocky steps and a steep drop near the end of this path led us on to a gravelled farm track, past some orange trees heavily laden with fruit and back onto the main road, to close our circular route. 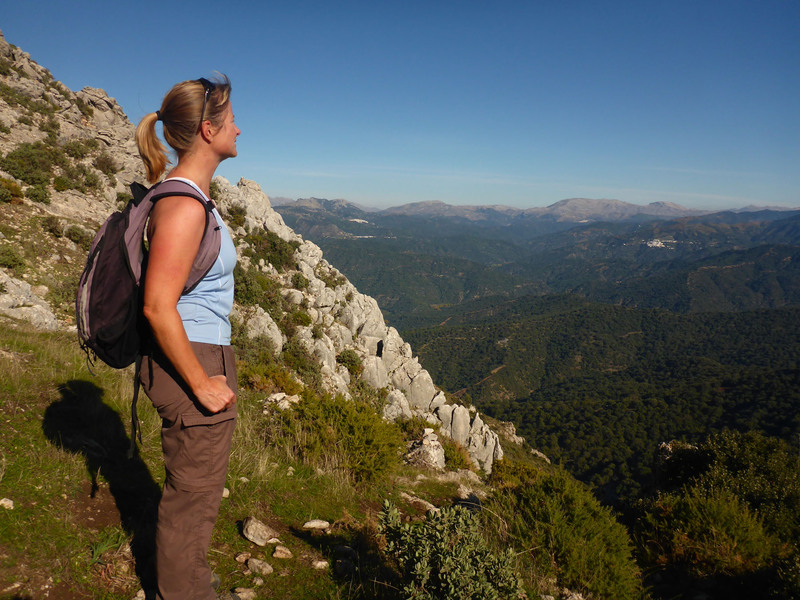 The distance was only 13km in total, but with a decent, sharp climb, incredible summit views and the wonderful close encounters with the griffon vultures, this definitely became a memorable walk in the Spanish mountains. 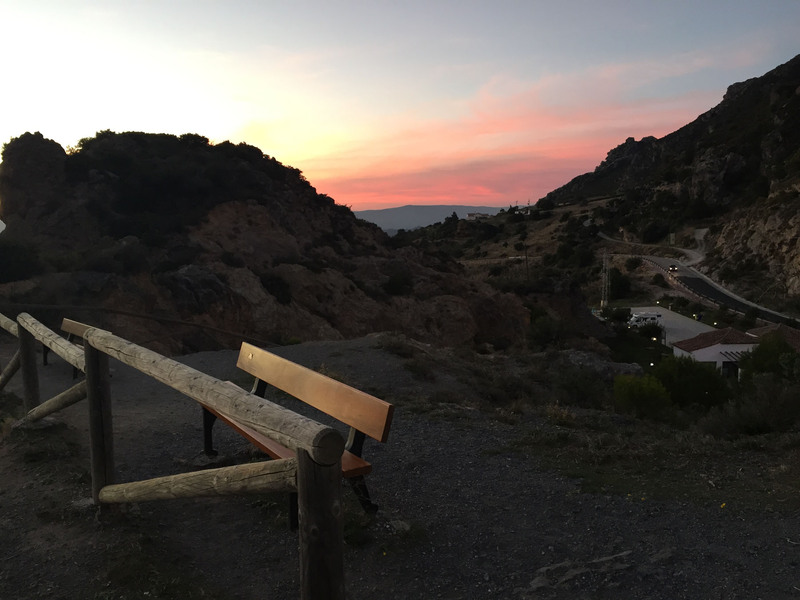 This entry was posted in Hiking, In Spain, Our Travel Journal, Spain on Nov 30, 2016 by Aaron Hill. 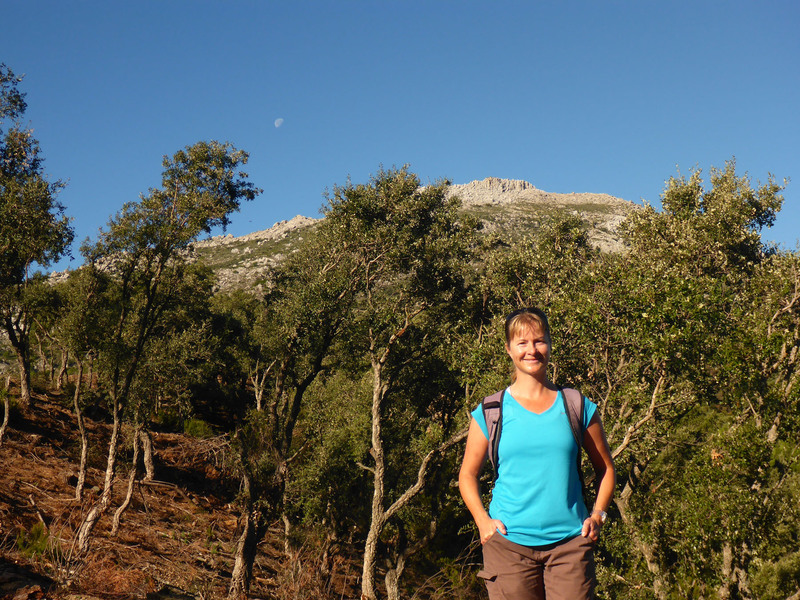 Hi, I realise this is a comment on quite an old post but we are just about to head over to Spain and Portugal for the winter – quick question, what maps do you use for walks and cycling? I’m worried i’ll really miss my OS maps. Fab blog by the way – am reading my way through it as we have a very similar travel plan and i’m picking up lots of great inspiration.